Gelegen im Stadtteil von Temple Bar, im Herzen Dublins, bietet das Kinlay House eine Reihe von sauberen und gemütlichen Zimmern an die kein Konto sprengen. Temple Bar bietet allen Besuchern eine unvergleichliche Auswahl von Bars, Pubs, Cafes und Restaurants an, in denen man die typische irische Atmosphere erleben kann. Nur ein paar Fussminuten bis zur Grafton Street -Dublins Haupteinkaufstrasse - und den zahlreichen Museen, Gallerien und Sehenswürdigkeiten, die die Stadt zu bietern hat, liegt das Kinlay House wirklich ideal für jeden Besucher. Kommt und erlebt die grossartige Atmosphere und lebhafte Stimmung! Alles sehr gut, leider gab es an den Betten keine Möglichkeit das Handy zu laden. All in all a very nice hostel with a great location. Close to the Temple Bar district and the Airport bus stops directly in front of the hostel. Rooms are very clean, the only thing I didn‘t like was the big emergency exit sign that stayed on over night and lit up the room as if the lights were on. Bathrooms are okay. Kinlay house is fantastic for a one or two nights stay. 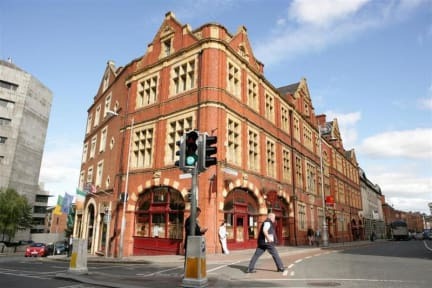 The hostel is located very close to all the great pubs so you can walk back after an evening out. The dorms and bathrooms are clean and there is everything you need for a basic breakfast (cereals, toast, honey, jam, butter, coffee). Sadly some guest don't have the same conception of cleanness so it may happen that the kitchen tools and pans aren't as clean as you'd wish they were... But that's probably something you have to expect. 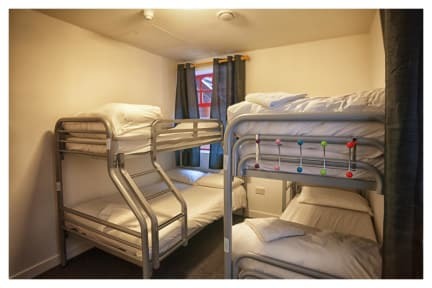 The Hostel is located in the center of "Temple Bar", Bar district of Dublin. A 5 minute Walk takes to either to iconic Pubs or to famous castles. The Staff is friendly and uncomplicated. The Dorm Room with 24 Beds is designed, such that there is hardly any privacy at all. The Bathroom is clean and located close to the dorm Room itself. All together: there are better Hostels in Dublin but none of them is located so close to the city center and therefore it is worth the money! We had a good stay! My second stay: Price okay for Dublin. Water was cold one time but this was bad luck i guess, didn’t happen on my first stay. Location very central only five minutes by foot to centre (temple bar). Great gastronomy in the neighborhood. Das Hostel war sehr sauber. Vor allem die Bäder waren immer geputzt! Wir waren in einem 6-Bettzimmer, es war klein aber ausreichen. Die Heizung könnte man leider nicht verstellen, deswegen war es nachts oft sehr heiß. Das Frühstück war gut! Was wir vorher nicht wussten und uns ein wenig gestört hatte war die „Kein Alkohol im Hostel“-Policy. Aber alles in allem war es ein gutes Hostel! We stayed in the 24 bed dorm and the whole room unfortunately had only 2 power sockets. Additionally the atmosphere reminded strongly of a hospital. However, the location is just amazing for that price, you can walk everywhere and are right in the city center. The location is very good, the hostel is clean. Staff could’ve been a bit more helpful and one thing really bugged me, seemed like security was not really taken seriously: the first two nights of my stay the door to the dorm was unlocked, also there is no control whatsoever of who comes into the hostel, even at night. Apart from that the stay was enjoyable.